Increasingly astronomers recognize that if the cosmos had not unfolded exactly as it did, humanity would not, could not, exist. Yet these researchers–along with countless ordinary folks–resist belief in the biblical Creator. Why? They say a loving God would have made a better home for us, one without trouble and tragedy. In Why the Universe Is the Way It Is, Hugh Ross draws from his depth of study in both science and Scripture to explain how the universe’s design fulfills several distinct purposes. He also reveals God’s surpassing love and ultimate purposes for each individual. Why the Universe Is the Way It Is will interest anyone who wonders where and how the universe came to be, what or who is responsible for it, why we are here, or how and when the universe ends. Far from leaving the reader at this philosophical jumping-off point, Ross builds toward answering the big question of human destiny and the specific question of each reader’s personal destiny. Do science and the Bible offer contradictory answers to life’s biggest questions? Hugh Ross the astronomer knows his science. This Christian author and apologist also knows Scripture. And he sees no conflict between the two. The same God who created the universe gave humans the intellect and curiosity to explore it. The search for answers takes us on a thrilling adventure of discovery. Ross leads the exploration by showing how cutting-edge research and key biblical principles agree. This faith-building page-turner is equally useful for personal and group study, deep reflection, and serious debate. Why the Universe Is the Way It Is opens our minds–and our eyes–to a stunning new view of the Creator. “Why?” may be the most common and emotionally charged question in human experience. With the Bible in one hand and the latest scientific findings in the other, astronomer Hugh Ross tackles many of our most pressing cosmic “why” questions. If God made the universe, • why would he make it so vast? • why would he wait to bring humans onto the scene? • why would he allow decay and death to be part of it? • why would he let one man and one woman ruin it for everyone? • why should I believe my life has any real meaning? • why is the future of the cosmos so bleak? Within these pages you will find compelling answers to these questions–answers that give you reasons to believe that our finely tuned universe “shouts loudly that life is more than a cosmic accident.” “This book will expand your mind with the universe it describes. 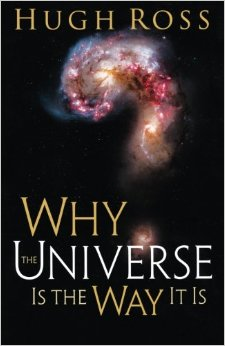 It is a challenging, fascinating, and mind-stretching discussion of the nature and purpose of our amazing universe in the light of Scripture by one of America’s foremost evangelical astronomers.”–Norman L. Geisler, cofounder and former dean of Southern Evangelical Seminary “Absolutely delightful! Ross’s ability to take science and show the biblical correlation in prophecy and application is unparalleled; it makes God’s wisdom and the biblical text seem so much more magnificent.”–James M. Tour, Chao Professor of Chemistry, professor of computer science, professor of mechanical engineering and materials science, Rice University, Smalley Institute for Nanoscale Science and Technology “A groundbreaking look at the enduring questions that confront every person regarding our existence. Utilizing today’s cutting-edge scientific research from a Christian worldview, Ross offers the most developed answers to date on key concerns regarding creation, God, and humanity. This book is a must-read for anyone who craves scientific information that interacts with tough biblical issues.”–John Ankerberg, bestselling author and host of the John Ankerberg Show “Ross simultaneously challenges skeptics and Christians alike with his fresh take on scientific discoveries that point to the existence of God.”–Ben Young, Second Baptist Church, Houston; author of Why Mike’s Not a Christian. Click Here to Visit Our Internal ==> Stephen Myer & Hugh Ross Page.